external economic accounts despite higher GDP growth; and a new low in U.S.-Pakistan relations. Many experienced observers believe that the odds favor a return to power of Sharif’s party – but the possibility of a surprise ending seems to be rising. What follows is a simplified guide to the main story lines that will unfold over the coming months. Political fracturing: Following reports by a journalists’ group that Prime Minister Sharif’s family owned companies and properties apparently caught up in a money laundering scheme known as the Panama Papers, two political parties – most prominently Imran Khan’s Pakistan Tehreek-e-Insaf (PTI) – put the matter before the Pakistan Supreme Court. A long and convoluted judicial and investigative process followed, with officials from the major government investigative bodies participating. The result was a Supreme Court judgment on July 28, 2017, that Nawaz Sharif was ineligible to hold elected office on account of wealth beyond his known sources of income. Nawaz Sharif was compelled to step down from both national and party leadership. But he is still campaigning hard, wrapping himself in the mantle of the PML/N (Pakistan Muslim League/Nawaz). Sharif’s younger brother Shehbaz, an intense and talented politician and chief minister of Pakistan’s largest province, lost out in the competition to succeed his brother as prime minister, but wound up as head of the party. Shahid Khaqan Abbasi, who became prime minister, is presumably working to build up his own power, but it is not clear how successful that has been so far. The other parties, not surprisingly, saw this as their moment to make a serious move for power. Former cricket star Imran Khan had been trying for years to replace Nawaz Sharif. He spearheaded a blockade of government buildings in Islamabad in 2014. The army support he hoped for did not materialize. In the past, his ability to mobilize crowds and attract prominent supporters has outpaced his electoral results, but this could change in either direction. There is still dark speculation about the army tipping the scales in his favor. His TIP (Tehrik e Insaf, or Justice Movement) remains the most serious competitor to the Sharifs’ party. The Pakistan People’s Party (PPP), once headed by Benazir Bhutto and now controlled by her widower Asif Zardari, has the second largest representation in parliament, and hence holds the “leader of the opposition” position. However, the PPP had effectively sat out the 2013 election. Despite energetic campaigning by Bhutto scion Bilawal, the party has clearly lost ground outside its home base in Sindh (the province that includes Karachi, the commercial capital of Pakistan). A collection of smaller parties have often been available for post-election horse-trading. Several Islamist parties have a sympathetic relationship with the TIP. Street violence has continued, much of it with a hard-line Islamist vibe. In late 2017, another dharna (blockade), spearheaded by a relatively new extremist political organization, blocked access to Islamabad for a couple of weeks, and was rewarded with the resignation of the law minister. In April 2018, the firebrand clericTahirul Qadri returned from Canada, threatening yet another dharna, sparked by a police firing incident in Lahore but aimed squarely at the (PML/N). And in early May, there was an assassination attempt against the Interior Minister, Ahsan Iqbal, blamed on one of the Islamist groups involved in the 2017 dharna. Other players: The army has always been Pakistan’s most important political actor. Most observers believe that it would prefer not to have direct responsibility for running the country. The army’s relations with Nawaz Sharif are bad, owing to years of disputes. Its ties with Shehbaz Sharif are much more cordial. Its relations with the PPP are also bad. The army does not appear to have a favorite contestant in this election, but would probably prefer not to have a political government strong enough to turn the balance of power toward the civilians. The other non-party player in this election is the judiciary. Nawaz Sharif’s ouster resulted from judicial action. This fits a pattern of judicial activism, some of it reflecting sensitivity to individual rights, but some aimed more politically at the ruling party. Nawaz Sharif and the PML/N have been running an increasingly bitter campaign against the “arrogance” of the courts. The opposition will be eagerly looking for any opportunity to throw the book at the PML/N. Economic worries: The good news is that economic growth in 2016/17 was over 5 percent after nearly a decade below 4 percent. Pakistanis are hopeful that the huge infrastructure package they have received from China, the China Pakistan Economic Corridor (CPEC) will bear fruit early. It includes a number of power generating plants, which when completed will start to remedy one of the Pakistan economy’s most pressing problems. Trade and payments deficits have increased sharply, however, as has the budget deficit. Pakistan had just completed an IMF program. Based on current trends they are likely to need balance of payments support from the IMF within the next year or so. This could also put pressure on the financial side of their relationship with China. The infrastructure package is financed with debt, and the amount involved could be problematic. International pressure. The FATF (Financial Action Task Force), a multilateral group that focuses on preventing terror financing, plans to put Pakistan on its watch list in June, which will require a program to strengthen its financial anti-terror. This “grey list” will not directly affect Pakistan’s ability to export and to make international payments, but it is not the first time Pakistan has been under this type of scrutiny, so the reputational damage has a price and getting off the list may be more difficult this time. Relations with the United States are strained. The Trump administration has suspended most military aid, and Pakistan has reacted angrily. The proposed U.S. budget will shrink worldwide economic aid as well. The FATF action was taken in response to a U.S. initiative, generating resentment in Pakistan. Pakistan’s other friends, notably China and Saudi Arabia, however, did not prevent the action. Relations with China are close, and China has bankrolled a massive infrastructure program. China at this point does not want to provoke a break between Islamabad and Washington. Election timeline: This year’s election will choose the National Assembly and the four Provincial Assemblies. Normally the leader of the largest party in the National Assembly becomes Prime Minister. If the largest party cannot command a majority, the leader of a coalition that can do so will be invited to form a government. A similar process takes place in each province. The five-year term of Pakistan’s current National Assembly runs out at the end of May, and the election must be held within sixty days after that. When the parliament’s term has run out, the president of Pakistan, in consultation with the prime minister and the leader of the opposition, appoints a caretaker government to serve until the new government has been formed. Supervision of the election is the responsibility of the Election Commission of Pakistan, which has already has reviewed the constituency boundaries and put forward its proposed changes. 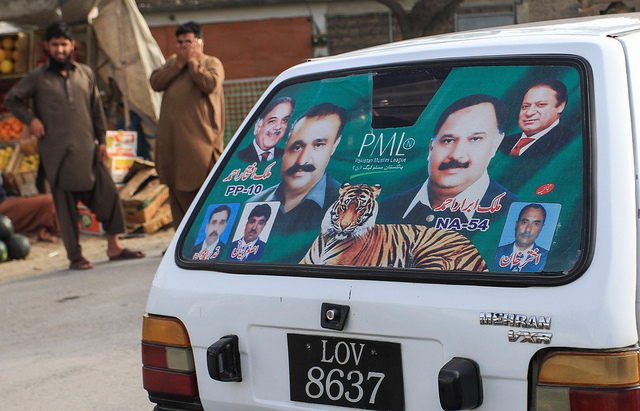 The early indicators appear to favor the PML/N. The party won surprise victories in a number of by-elections earlier this year. In the Senate elections held in early March, the Sharifs’ party took practically all the seats in Punjab, and remains the largest single party with about one-third of the seats. The PPP lost 6 seats; the PTI gained 5. The PTI’s gains bear watching. 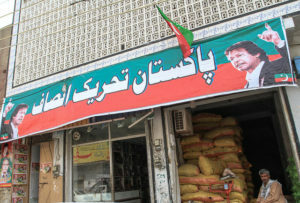 The other big change was the increased number of independents, some of them former members of the Sharifs’ party – opening the door to horse-trading and perhaps a messy coalition. And the Senate election results underscored a vulnerability for Pakistan’s major parties. None of them has broad based power across the country. 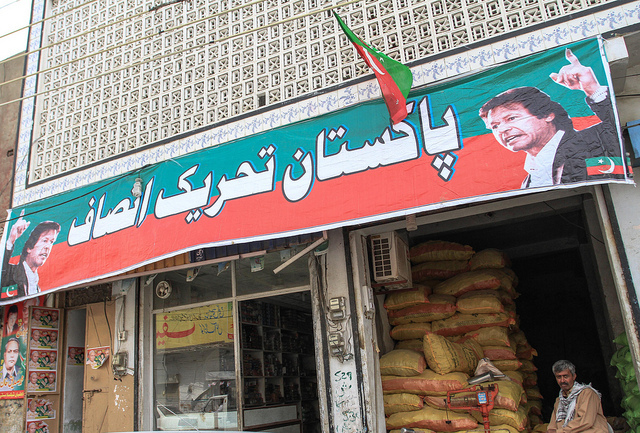 The PML/N has the largest base – in Punjab; the PPP is largely confined to Sindh; the PTI is strongest in the relatively small Khyber Pakhtunkhwa. As always, the army will wield a great deal of influence behind the scenes, and may play a role in encouraging political horse trading. At this writing they do not seem interested in taking over, but if things get messy enough, that could change. A well-written, balanced report which should be a useful guidance sheet for non -Pakistanis.